Michael Matthews wins stage 1 of Vuelta al Pais Vasco, his first victory of the season, as Australians sweep the podium. 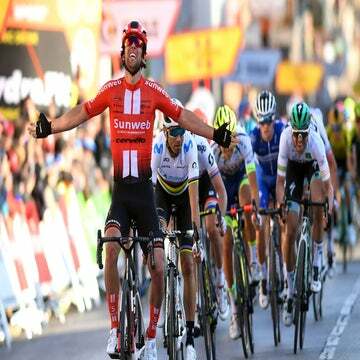 Michael Matthews led an Australian sweep of the podium in stage 1 at Vuelta al Pais Vasco Monday in Eguesibar-Sarriguren, Spain. 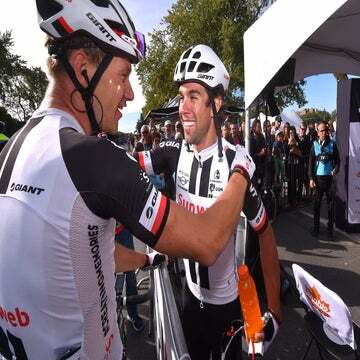 Sunweb’s Matthews out-sprinted Jay McCarthy (Bora-Hansgrohe) after 153.3km of racing, while his former Orica teammate, Simon Gerrans finished third. One of McCarthy’s teammates led things out into a sharp right-hand bend about 200 meters from the finish. The Bora rider came out of the corner first, but Matthews was right on his wheel and powered past for a convincing victory. The final five kilometers were animated by a solo attack from Quick-Step’s Julian Alaphilippe, but the Frenchman was stymied by an untimely flat tire. He was forced to return to the peloton, and a sprint finish was assured. Defending champion Alberto Contador (Trek-Segafredo) also suffered some misfortune in the finale, getting tangled in a crash. He crossed the line behind the peloton and did not appear to be injured. “I’m not hurting anywhere for the moment,” Spain’s top Tour rider Contador said. He did not lose any time in the race overall, as the crash occurred in the final kilometer of racing. 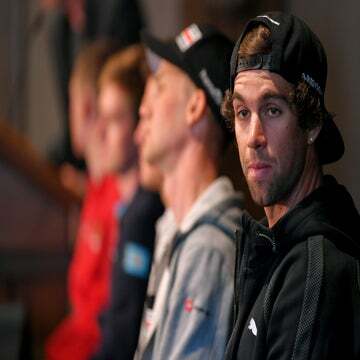 The 26-year-old will carry the race leader’s jersey into stage 2, a hilly 173.4km run from Iruñea to Eltziego, which could also favor Matthews’s talents as a sprinter who can survive a few climbs.